O happy day. Botox is on the way! Thanks so much, dear friends, for the prayers and good thoughts. God’s answer was even better than getting a call to fill in on another patient’s cancelled appointment, which was what I had hoped for. Instead, one of Dr. B’s physician assistants called and rescheduled my May appointment to April 9, just 13 days away and on target for the botox to occur on schedule. And, on top of that, in another huge serving of happy, she went ahead and scheduled appointments for the June follow up to the April 9 treatment and a July appointment for the third of my four yearly botox treatments. She also told me to call her if I ever run into delays on my botox appointments again. She said the schedulers have no leeway, but she can sometimes tweak here and there to keep me on track with the treatments. I went back and read the post that included my whining about the botox delay. It was at the end of a post here. I had forgotten that I expressed my desire for a guilt-free appointment. But God doesn’t forget. Thank you, God. Whoo hoo! I am doing a happy dance in my head. I count watching grandkids engaged in their sports and arts instruction as prime entertainment. 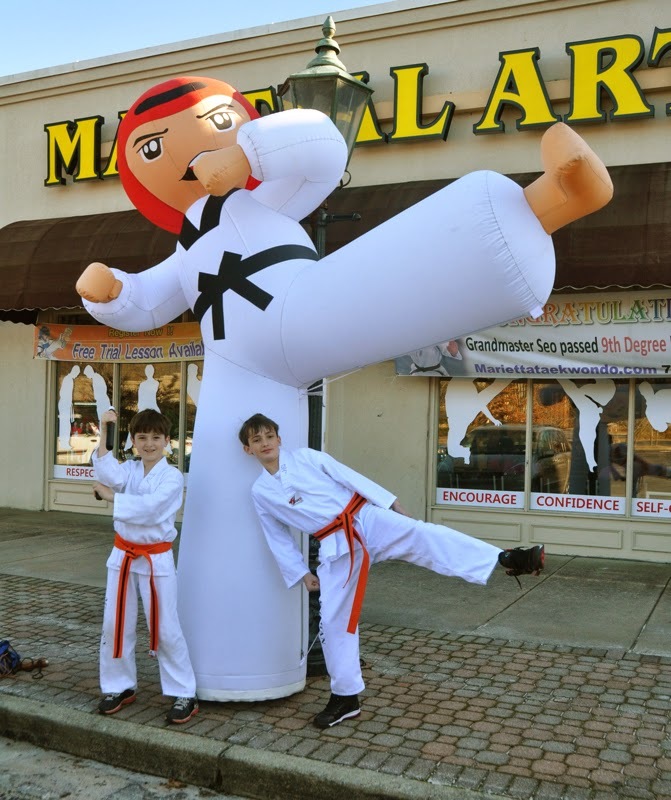 I had been hearing about our Georgia grandsons’ martial arts lessons for awile. I was pleased with the opportunity to be on hand for their Saturday Taekwondo session during a February trip to Georgia. 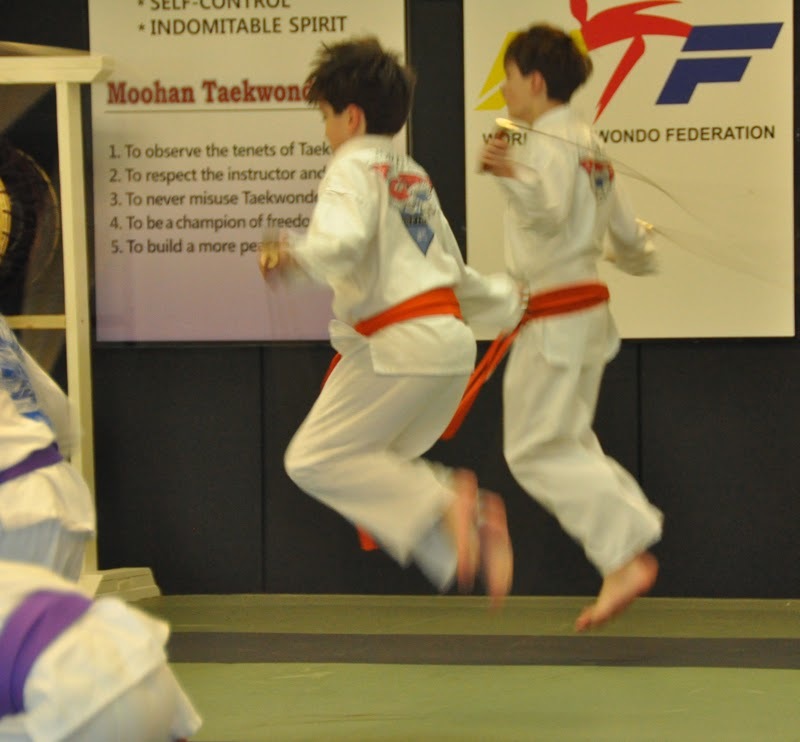 Taekwondo is a Korean martial art. It combines combat and self-defense techniques with sport and exercise (Wikipedia). I was impressed with the stretching, introduction to meditation techniques and exercises to develop core strength that I saw. Some of the exercises were the same ones I do at home as part of my stroke therapy. In addition to building strength, the session included exercises for speed, balance, flexibility, and stamina. I especially liked the emphasis on courtesy and respect. 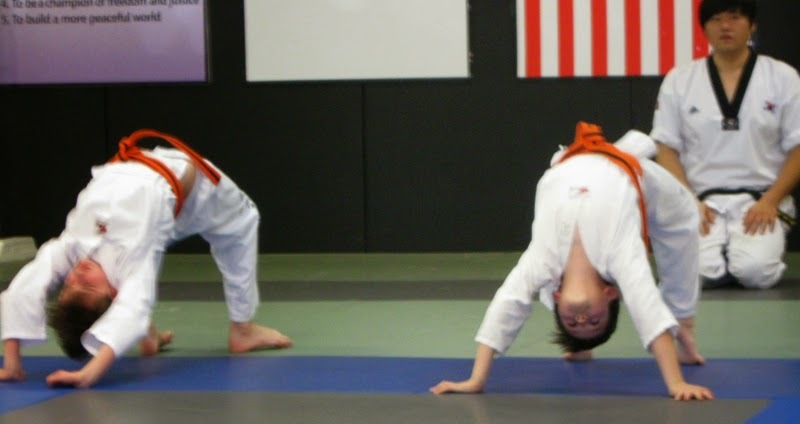 From what I observed the instructors modeled that behavior and required that the students extend courtesy and respect to fellow students, instructors and parents. These boys are growing up so fast. I am thankful for Walt and Sarah’s attention to all facets of their physical, intellectual and spiritual development while giving them freedom to make and learn from mistakes and consequences of immature judgment. I noticed the apparition above while I was sitting on the sofa, strapped into a Dynasplint for my left elbow, a 75-minute daily chore to combat permanent shortening of muscle and nerves affected by my stroke. Since I am not supposed to walk around while in the splint, I had plenty of time to enjoy experimenting with different settings to snap a photo from where I sat. Can you identify the bizarre visitor on my windowsill? The answer is at the end of today's post. As usual her post is thought provoking, as are the comments. Many folks, it seems, consider “old” as any age beyond their own accumulation of years. I can remember at 14 or 15 thinking of my mother as old, not as in elderly but definitely not young. But at a family reunion several years ago, someone had photos of the reunion when I was in my mid-teens. One snapshot was of my mother and me outside, carrying our “reunion” foods. 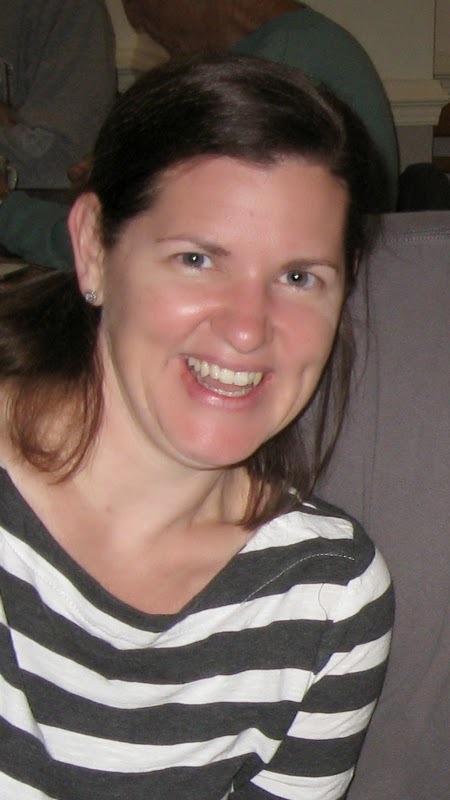 At 42 she looked like a sister, and not a much older sister either. Wish I had a copy of that snapshot now. 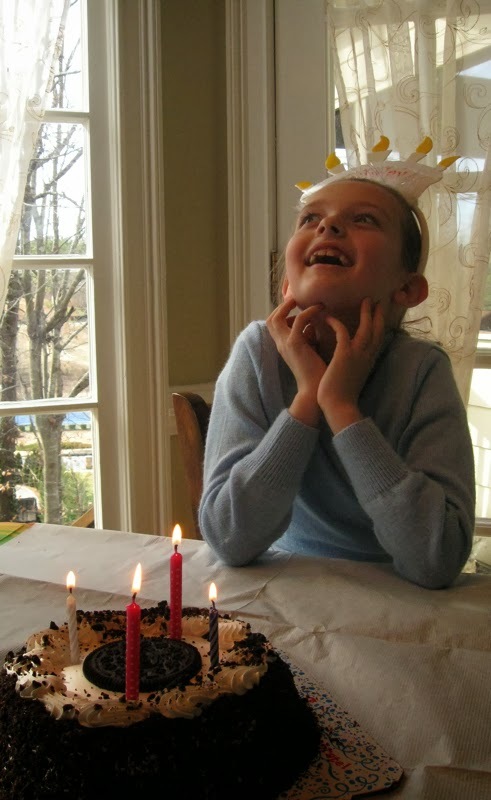 I mentally passed an aging milestone on my 45th birthday. I was driving when I suddenly felt a pebble in my mouth. It was no pebble. It was the top of a front bottom tooth that had fallen off. Ever since, I have just been thankful on each birthday, including my recent 67th, when no other body parts have fallen off. Old, yes. Stroke survivor with major limitations, yes. Still enjoying life, definitely. 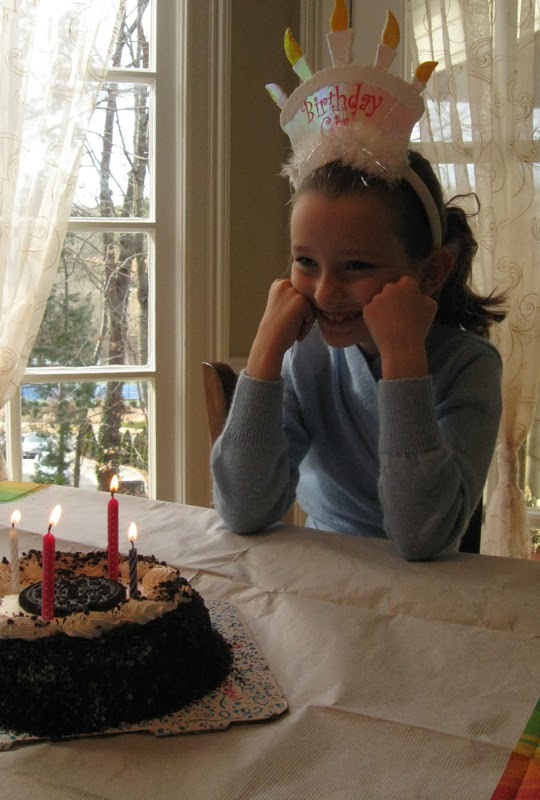 Participation in celebration of our Georgia grandchildren’s birthdays is often an impromptu affair long after the official celebration. 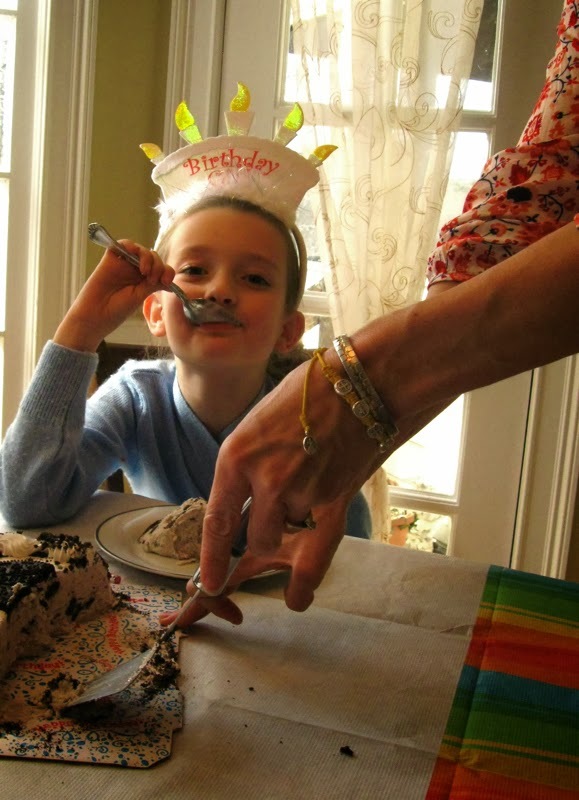 But parents, birthday grandchild and siblings all seem to accept the informal, low-key affairs executed by their grandfather Baboo with the help of their mom. Charlie, a January birthday girl, was the honoree during our February visit to Georgia. 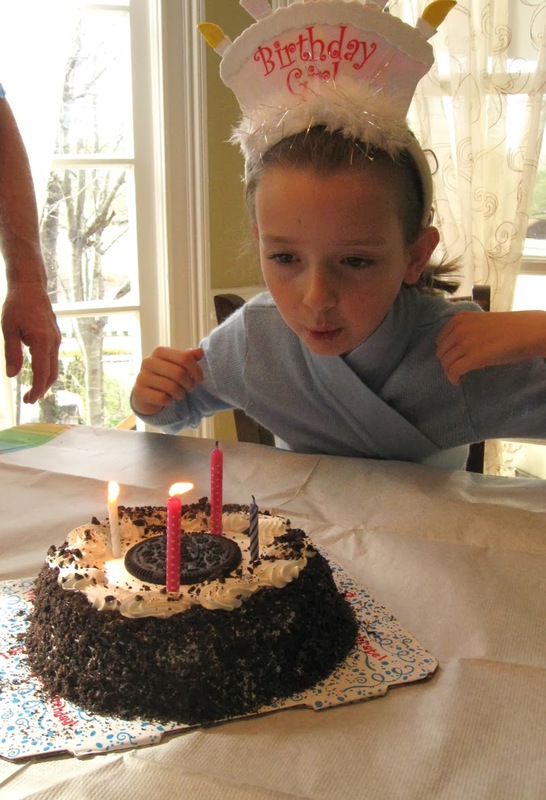 She and Baboo returned from a Saturday afternoon trip to the store with a “cookies and cream” ice cream cake. Yes, we enjoyed! It is a seed pod of an amaryllis with the two dried blooms still attached. The blooms were deep red. The bulb and everything I needed for planting was a much enjoyed Christmas gift from our Georgia tribe. 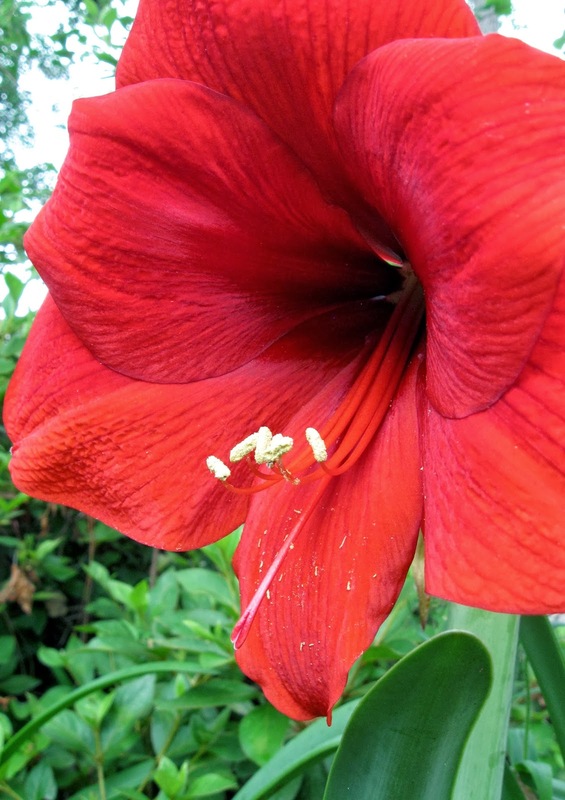 I hope the seeds will be viable and a source of more of those red blooms. 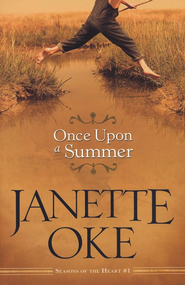 In Once Upon a Summer, the first in Janette Oke’s Seasons of the Heart series, Joshua Jones had lost his parents before he was old enough to retain memories of them. 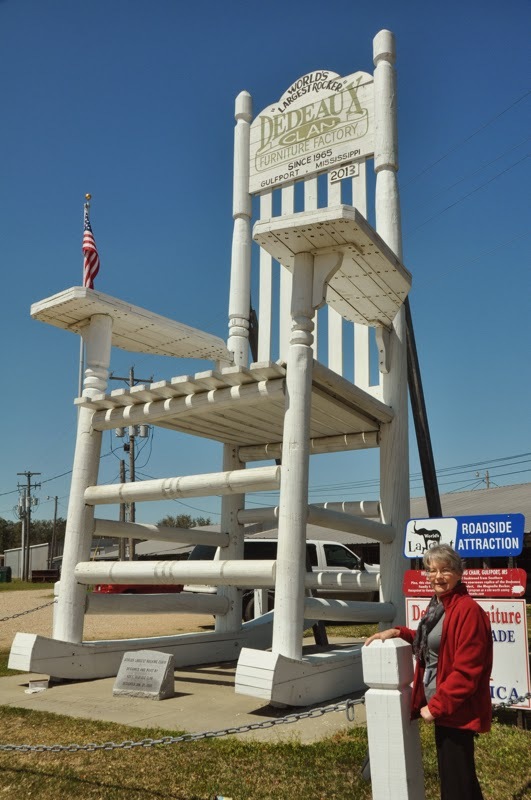 Since his infancy, he had been raised and loved by his Aunt Lou, Grandpa, and Uncle Charlie at his Grandpa’s farm. Their guidance had imbued him with a strong sense of right and wrong and personal responsibility. Josh recognizes that although his family is not the standard mother, father and children, his is a close-knit, loving family in which every individual works hard with good humor and values each other. But an overheard conversation plunges a horrified Josh into fear that his beloved Aunt Lou will be expected to marry soon. Josh’s eventful summer is marked with his strategies to thwart the matchmaking efforts of the adult men in his family and his struggle with questions of loss, love, faith and change. Josh tells his own story of summer, revealing in his boy’s voice his journey toward young manhood. I enjoyed several of this author’s books of inspirational fiction several decades ago. Even though this was a free Kindle book, the author did not disappoint with this easy-to-read tale. I don’t know how long it will be offered free, but it was still free on Amazon.com at 8:45 p.m. Central Daylight Savings Time March 9, 2014. A personal digression: Josh’s perceptions and actions made me recall how much my late mother loved teaching children of Josh’s age. She said her third graders, especially the boys, experienced dramatic changes. She noted that the planes of their faces became more pronounced. They lost that “little boy” look. And like Josh, her students were beginning to question things formerly accepted without question and to ponder life, even if they did not always have the vocabulary to articulate what was stirring in their thoughts. She considered it a pivotal season of life, ripe for teachers to make a difference. 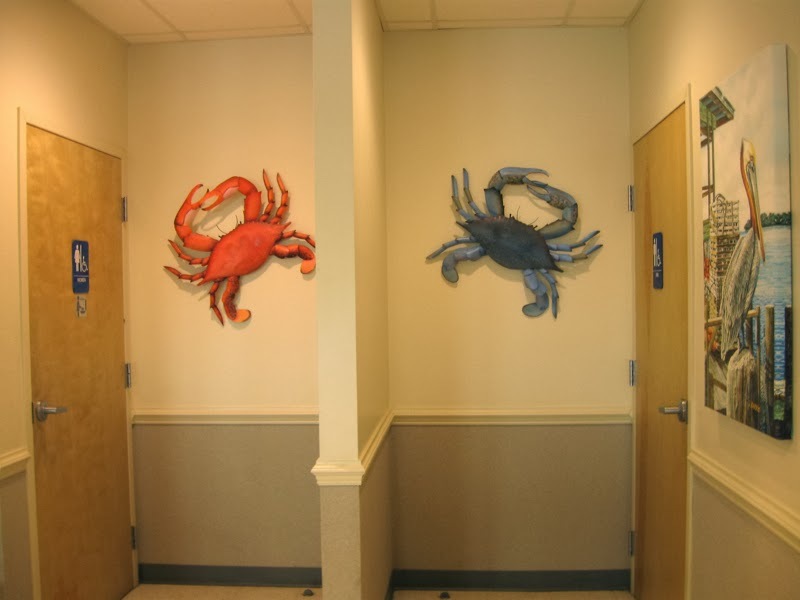 While waiting for Husband Walter to pay for our breakfast at McElroy’s Seafood Restaurant, I noticed the crab decorations on a wall adjacent to the restrooms. That represented a modest but savored accomplishment for me--paying attention to more than one thing at a time without falling over. Keeping my balance in that busy area usually keeps me focused on people moving around me, and I stay ready to recover if someone bumps or brushes me. This time, though, the crabs also caught my attention. Shaped like the tasty blue crabs that inhabit our coastal waters, one was orange and one was blue. The real crustacean is not totally blue. The blue is mostly on its five pair of legs--the large claws in front, the three pair of regular legs, and one pair of swimming paddles in the back. 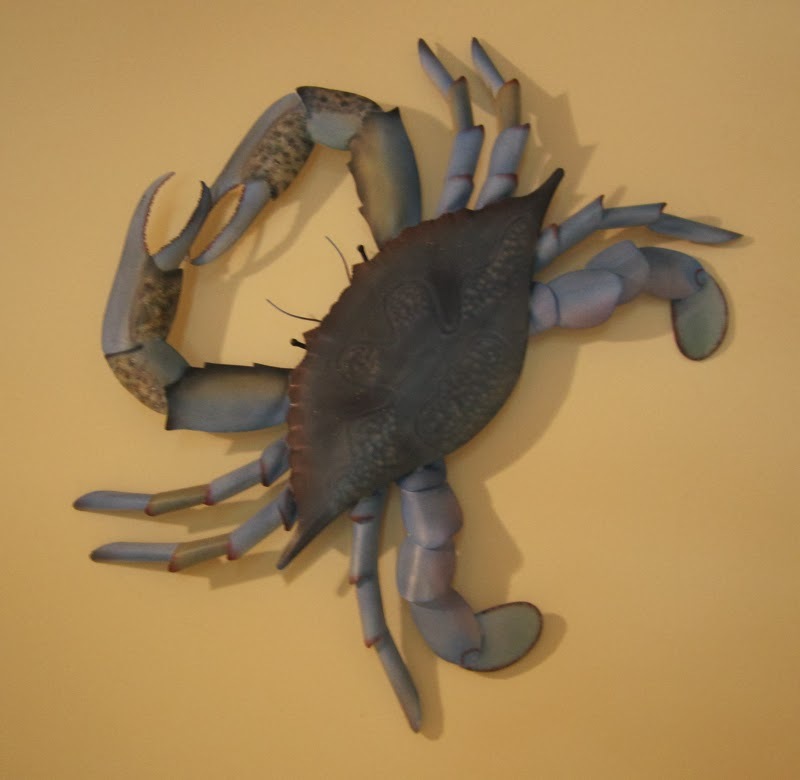 The blue crab was next to the men's room. The orange crab was by the women's. I briefly considered then dismissed the thought that there was a significance in placement related to gender. Or maybe the colors portrayed cooked and uncooked blue crabs. 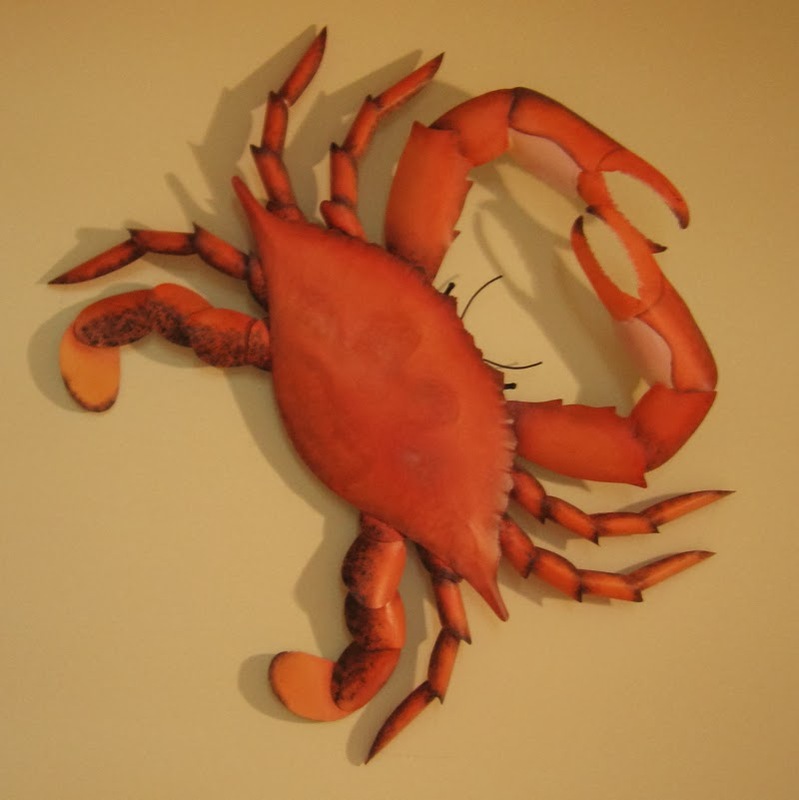 And that brought me back around to the possibility of positioning based on gender: Could the orange, cooked crab be a saltwater version of "your goose is cooked"? Might the uncooked crab by the men’s room fall under the category of "half-baked"? Nahhh. I decided it was merely a marketing decision by the producers of crabby décor. By the time I braked my runaway train of thought, Hubby had completed his transaction and was ready to go. He unwrapped the Andes chocolate mint he had just added to the total and popped the treat into my mouth. Yum! Still upright and enjoying chocolate. A great beginning to the day. Our Louisiana grandchildren and parents are busy celebrating Mardi Gras season. 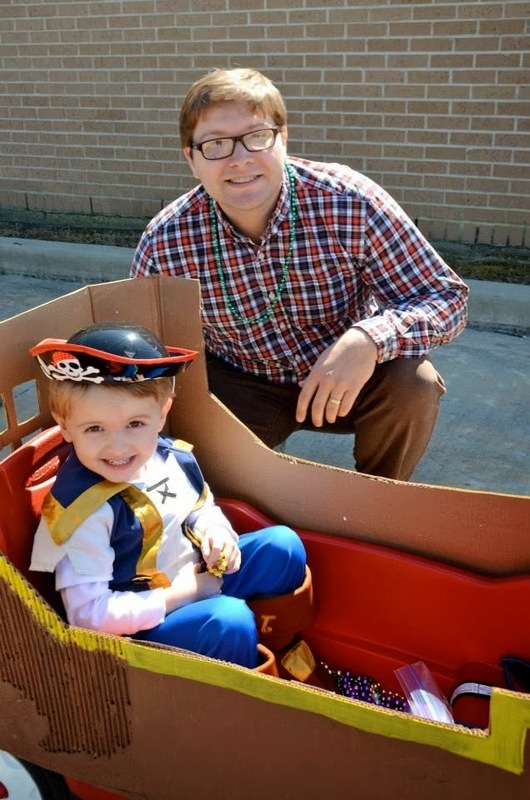 Daughter-in-law Katie sent photos she took of three-year-old Walker’s entry in his preschool’s Mardi Gras parade Friday. 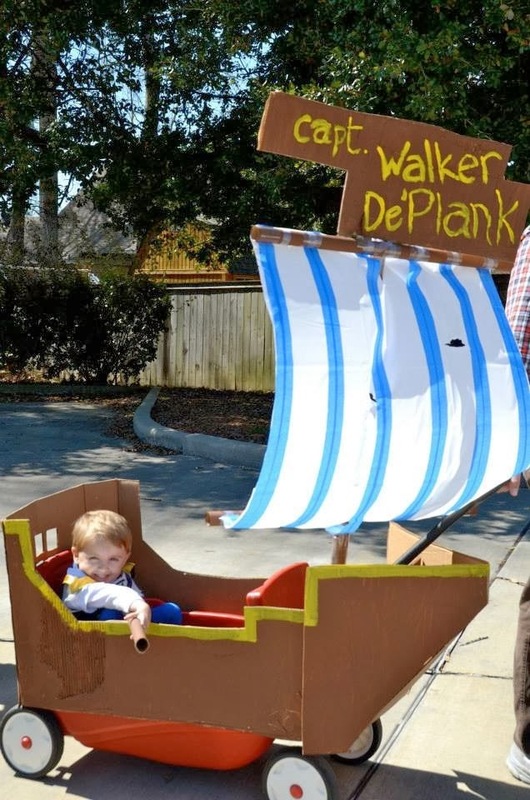 Walker was Captain Walker DePlank, complete with sailing ship, spyglass, buccaneer attire, and a potentially lethal pun for his name. 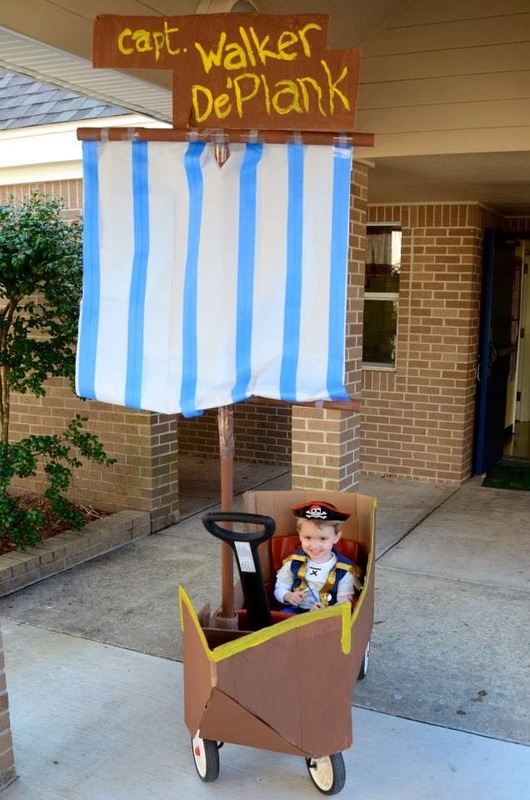 Walker’s parents turned the kids’ little red wagon into a pirate ship. Katie made the sail. She called to alert me that photos were on the way. She also praised our son Jeremy’s shipbuilding prowess. She knew I would be an appreciative audience for both bits of information. 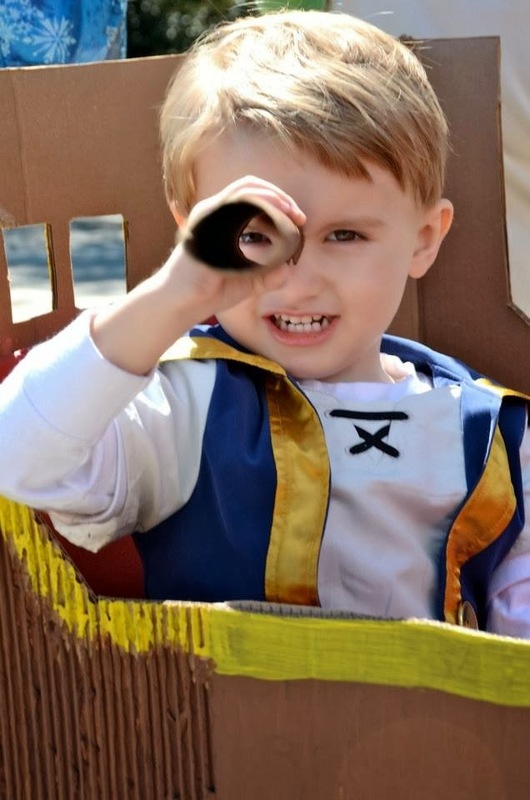 Jeremy was especially pleased with the moniker he chose for his little pirate. Walker was one happy pirate. I was happy, too. I’m addicted to puns . . . and grandkids. Temperatures here on the Mississippi Gulf Coast continue to vacillate between spring and winter. 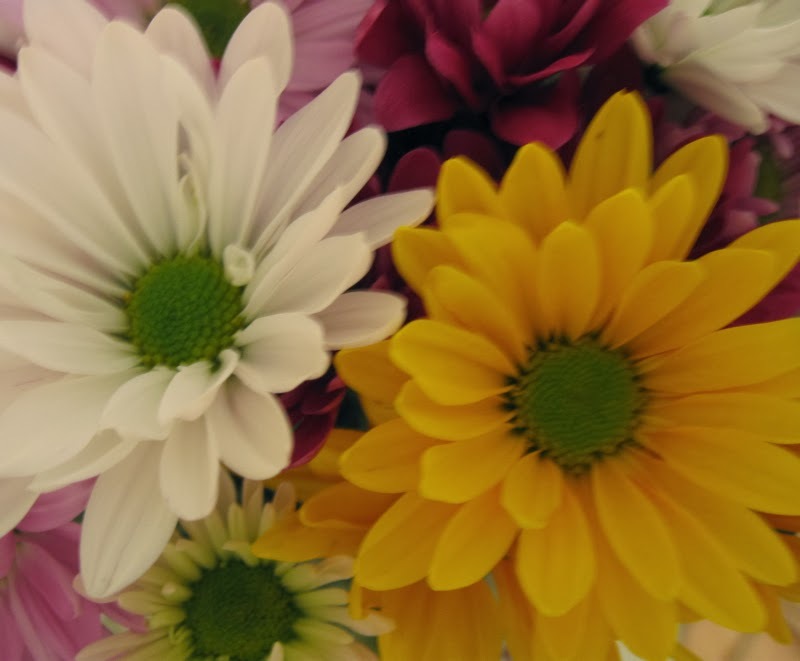 Indoors, though, I am enjoying cut flowers, blooms growing, and seeds sprouting. An amaryllis bulb, one of two our Georgia tribe gave me for Christmas has bloomed—two blooms on Monday, a third on Wednesday and a fourth on the same stalk Saturday. 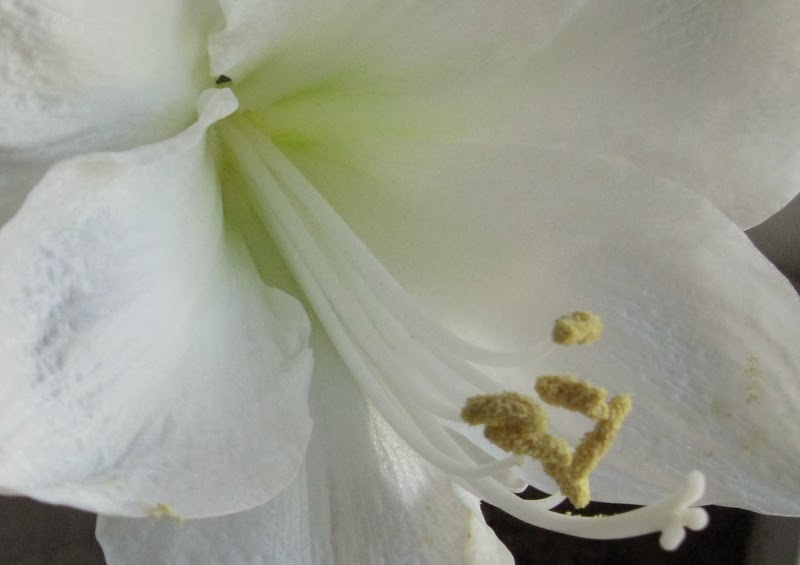 It is my first pure white, a happy addition to the solid reds, reds with white streaks and white with red streaks that my late mother and aunt passed along to me through the years. 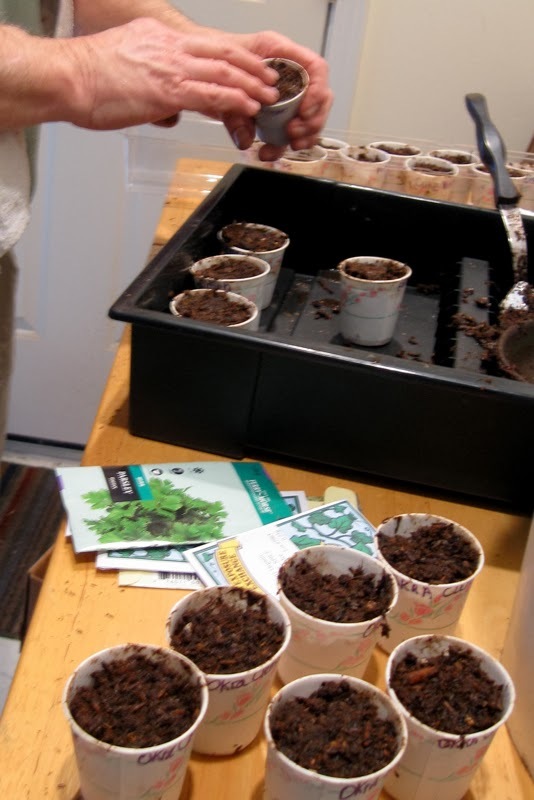 We also have seeds sprouting inside, thanks to Husband Walter. He rigged up a couple shop lights and an easy way to raise them higher as seedlings grow. He also planted some of the seeds that I had ordered earlier online. 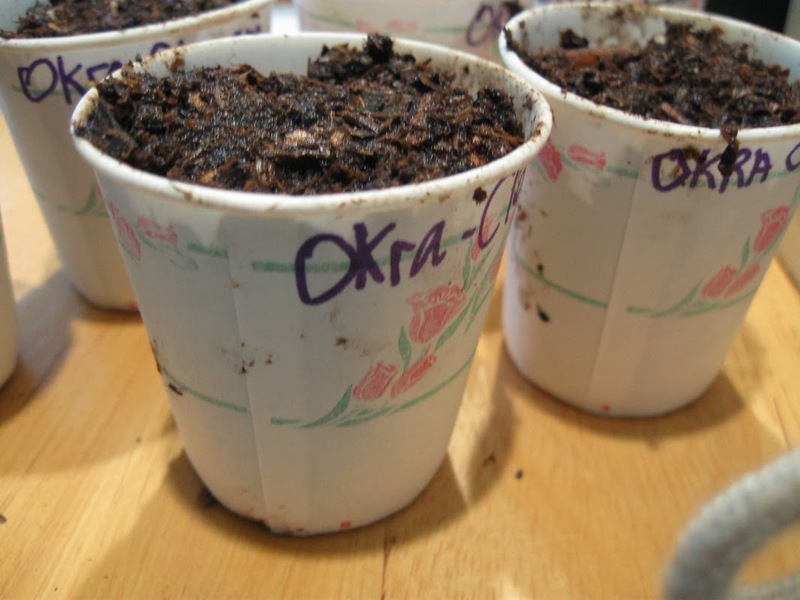 My part was labeling little paper cups so we could identify the different veggie plants at transplanting time. I already had the cups. A relative has had success with them; plus they were less expensive than peat pots. We are still learning. 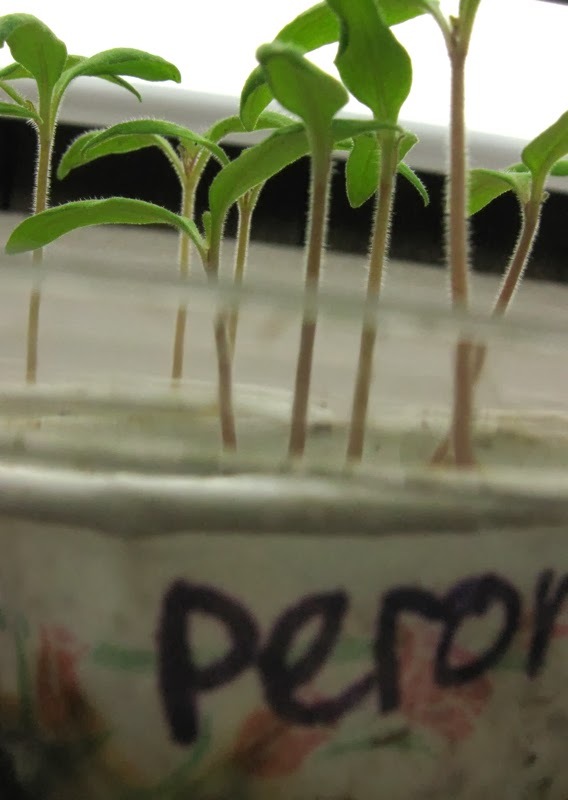 And one thing I have learned is that seedlings are like pets. You can’t just up and leave home without making provisions for them. Ours were sprouting and unfurling those first little leaves. The baby plants were bright green, sturdy and straight. That was the night before we took off on a jaunt to visit our Georgia grands and their parents. 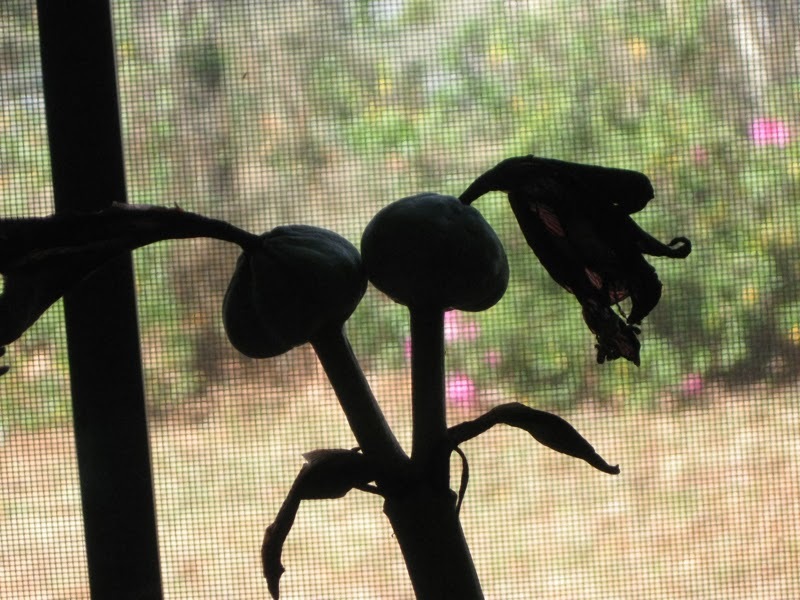 We left them on our porch where they would be protected and receive at least some sunlight. When we returned five days later, they were a bit leggy and not as happy looking. If we choose to start our own seeds in the future, we will need to fine tune the scheduling of our travels.